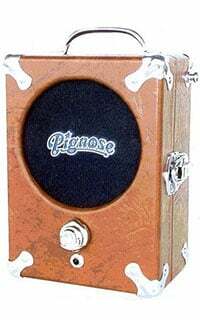 Pignose portable amps are almost on a level of their own. Simple in design and rather affordable, these little cigar box sources of awesome guitar tone have been used by many popular guitar players around the world. If you are looking for a more classical yet quality tone in a versatile package, Pignose Legendary 7-100 should definitely be on your radar. Let’s take a closer look and see what this thing is all about. 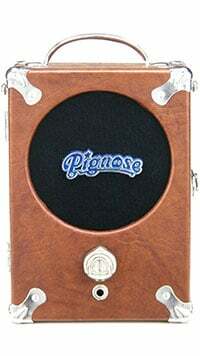 If there is one thing you quickly learn about Pignose portable amps, it’s that controls are not something that this brand considers to be important. You can turn this box around all you want, the only thing you will find is the on/off switch and a volume knob. The key to controlling what this amp does is to be proficient with the volume knob on your guitar. Tone shaping is done simply by opening up more gain from the guitar itself. This inherent simplicity is exactly why this amp has become so popular over the years. While some might find it top be extremely limiting, keep in mind that the price and performance of the Pignose Legendary 7-100 compensate rather well for it. The most important features found on the Legendary 7-100 are its power and speaker. You are looking at some 5 Watts of juice being fed directly into a rather well voiced 5 Inch speaker at the front. When it comes to portability, there are two options you have for supplying the necessary power to the amp. You can either use the AC adapter which doesn’t arrive with the amp, or you can use 6 AA batteries. In order to install the batteries, all you have to do is open the amplifier and find the slots for three batteries on each side of the speaker. Pignose has designed the Legendary 7-100 to be fairly versatile as a recording amp. This is only emphasized by the presence of the pre-amp out port in the back. The absolute best thing this unusual amplifier has to offer is its tone. If you didn’t know what you were listening to, it wouldn’t be that hard to misjudge the performance of the Legendary 7-100 for an all tube amp. That is how good it really is even though it’s a transistor based unit. Cleans are impressive, especially when fed through the speaker. If you choose to record them directly using the pre-amp out, they actually lose some of their aesthetic. Switching between clean and dirty is as easy as rolling off the volume knob. At full gain, you get a fuzzy distortion that is rich with overtones. If that is too extreme for your taste, just reduce the volume on your guitar to about 12 o’clock position and you will get a mellow overdrive instead. 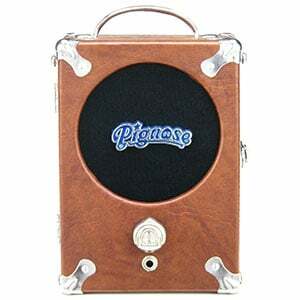 At the end of the day, Pignose Legendary 7-100 is one of the more unusual portable amps on the market. With that said, its performance makes it a very solid choice for anyone who wants a more vintage tone. As a complete package, it is fair to say that Pignose struck a sweet spot in terms of bang for the buck value they offer. For more info about the Pignose Legendary 7-100, click here.